Saturday was marked by Iran’s statements proclaiming advances towards a comprehensive nuclear agreement with the 5+1 Powers (US, Britain, China, Russia, France, and Germany). The most prominent was a declaration by Ali Akbar Salehi, head of the Atomic Energy Organization and former Foreign Minister, on both uranium enrichment and the status of the under-construction Arak heavy-water reactor. Iran and the 5+1 Powers resume talks in mid-May in Vienna, with a view to a comprehensive settlement before an interim deal expires on July 20. Salehi said, “Based on the (interim) agreement with the West, we were supposed to have half of our 200 kilogram stock of (20%) uranium diluted and the other half converted to uranium oxide,” and said the process was being completed. Earlier this week, the International Atomic Energy Agency said that 75% of Iran’s stock of 20% uranium had either been diluted to 5% or converted to oxide powder, which cannot be used in a militarized nuclear program. 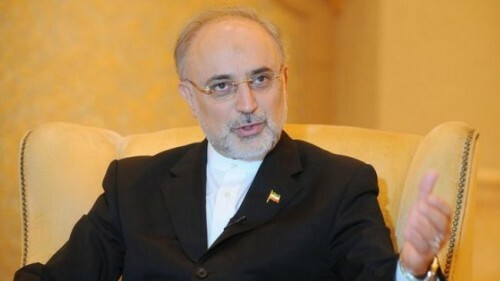 Salehi also offered a reassurance about the Arak reactor, due on-line by the end of 2014. He said that Arak could be “re-designed”, reducing the amount of plutonium by-product by 1/5th. Western powers have expressed concern that the plutonium could be used in nuclear weapons. And Salehi said Tehran has “no problem” with a visit to the Parchin military base by the IAEA if it offers a “logical reason and conclusive evidence”. Iran has resisted any inclusion of military facilities in a comprehensive nuclear agreement, while negotiating visits to Parchin by the IAEA. US diplomats and analysts claimed in recent years that Parchin was housing a high-pressure containment chamber which could be used for components for an atomic bomb. Speaking to Iranian women on Saturday, the Supreme Leader said Western thoughts on issues such as women’s employment and gender equality should be rejected. Equality does not necessarily always translate into justice. Justice is always right, but equality is at times right and at other times wrong. Westerners, for various reasons, have misunderstood the issue of woman and have spread that wrong and destructive notion worldwide, and through making commotion they are not allowing others to speak out. Contrary to some viewpoints, employment is not women’s major issue. Women’s employment… is acceptable, albeit as long as it does not conflict with the major issue, to be precise, the family. Islamic Revolutionary Guards commander General Mohammad Pakpour has rejected claims that Iranian forces are involving in fighting in the Syrian conflict. Pakfour, the head of the IRGC’s ground forces, said only “military attachés” are in Damascus. “The IRGC is exercising no military presence in Syria,” Pakpour told a Tehran ceremony on Saturday. The commander did assert that the “attachés” have been involved in consultation for the formation of the National Defense Force, pro-regime militias created in 2012 to provide manpower in the fight against the SYrian opposition. Videos and witnesses have confirmed the presence of Iranian officers providing training to the militias and leading them in small-scale operations in the battlefield. Claims of Iranian forces on the ground have not been supported, although there have been some members of the Iranian forces killed in Syria in the last two years. Iran systemically says they died defending the Sayyeda Zeynab shrine in southern Damascus.